But real life is not something out of Disney. In the spring of 2011, fresh off two sparkling track years that seemed to be sprinkled with pixie dust, Figuereo graduated from Northern Essex Community College. But Figuereo was uncertain about her future and, rather than attend a four-year college after graduation, she took the next year off from school. A couple of certainties remained in the 22-year-old’s life. First, Figuereo wanted to continue her budding track career – so she joined Dare to Dream, a Boston-based track club. But, more important, she wanted to remain nearby her maternal grandmother, Agueda Payano, who has Alzheimer’s. Figuereo has cared for her grandmother the past few years and continues to provide care today at the family’s Haverhill home. “She was trying to decide what she wanted to do with her life,” said Peter Early, the sprints coach at Merrimack College. Early had a connection with Figuereo. The two were track teammates at Haverhill High, with Early being two grades ahead of Figuereo. An assistant track coach at Merrimack, Early had followed Figuereo’s meteoric ascent from talented but raw high school sprinter to two-time national champion at Northern Essex to bona fide college recruit with Dare to Dream. “It took some convincing, but she knew she wanted a college degree,” recalled Early. So rather than a trip to Disneyland, Figuereo committed to Merrimack College. And last fall Figuereo hit the North Andover campus running – fast. “I felt comfortable with Merrimack. Coach Early went to high school with me, so that made it an easier transition,” Figuereo said. 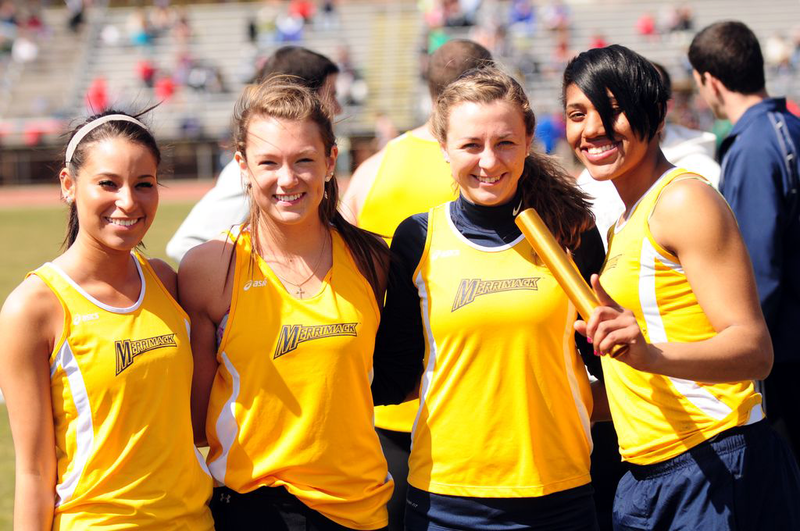 This 2012-13 indoor track season, Figuereo rewrote Merrimack’s school record book. She established new marks in the 55-meter dash (7.18 seconds), 60-meter dash (7.68), 200 meters (24.92) and 4 x 400-meter relay. Figuereo’s superb season did not go unnoticed. She was named to the U.S. Track & Field and Cross Country Coaches Association’s All-East Region Team. 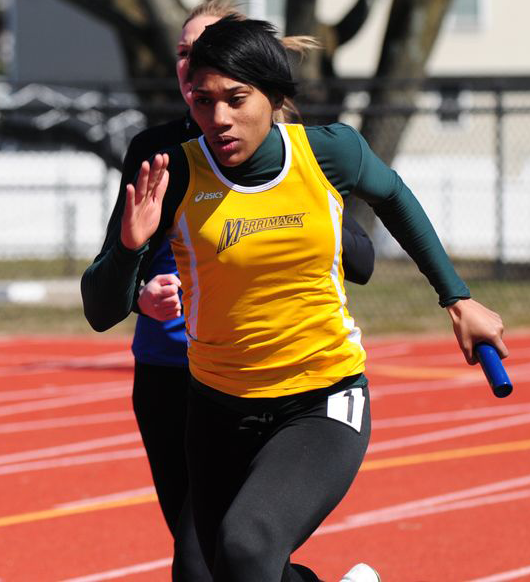 She was also named the Northeast-10 Conference Rookie of the Year and qualified provisionally in the 200 meters for the NCAA DII Indoor Championship. She was an eyelash away from qualifying in the 60 meters, missing the standard by .0001 of a second. All the while the sophomore was taking care of her grandmother. When at practice, Figuereo’s influence on the team is profound. “She is very motivating and is bringing up the whole program, because everyone sees how hard she’s working,” Early said. This spring, despite a bulging disk in her back, Figuereo is determined to earn a trip to Division II Nationals. She hopes to place in the top-6 and earn All-American status. That wouldn’t be too bad for someone who didn’t run spring track during her senior year at Haverhill High. “I was taking care of my grandmother. I also needed to focus on my studies. It was a difficult time and I missed track,” she said of that spring. “One of the biggest reasons (I chose Northern Essex) is that I was so close to my family and could continue taking care of my grandmother,” she said. With surgeon-like focus, Figuereo set her sights on the 2010 Division 3 National Junior College Association championships. Poised and in peak shape, Figuereo won the 200 meters (25.75 seconds) and secured bronze in the 100 meters. A year later, Figuereo returned to the Division 3 National championships. “I really didn’t think I had a chance to win. But I told myself, ‘I was national champ once and I can do it again,’” she said. She was prescient. Figuereo captured the 100 meters becoming Northern Essex’s first – male or female – two-time national track champion. She added a silver medal in the 200 meters. Figuereo’s performances were even more meaningful as she had dedicated her races to her grandmother. Today Figuereo has set high goals for both on and off the track. She hopes to graduate with two degrees – one related to the health sciences, the other in nursing. As for track, her “dream goal” is to represent the Dominican Republic in the 2016 Olympics. And as she balances academics and athletics, Figuereo will continue to care for her grandmother.